Irn-bru (pronounced iron brew) is a popular carbonated soft drink produced in Cumbernauld, Scotland where it has been made by A.G. Barr of Glasgow since moving out of their original Dennistoun factory in the mid 90s and at a second manufacturing site in Mansfield, England. In addition to being sold throughout the United Kingdom, Barr's Irn-Bru is also available in many key markets throughout the world where there is a significant community of people from its native Scotland. Innovative and sometimes controversial marketing campaigns have consistently kept it as one of the best-selling soft drinks in Scotland where it competes directly with massive global brands such as Coca-Cola and Pepsi. Irn-Bru is famous for its bright orange colour. As of 1999 it contained 0.002% of ammonium ferric citrate, sugar, 32 flavouring agents (including caffeine and quinine) and two controversial colourings (E110, E124). 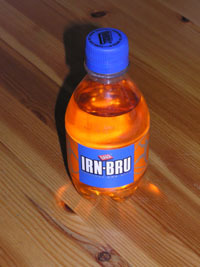 The beverage is advertised as having a slight citrus flavour, but many have differing opinions of the exact taste of Irn-Bru. Irn-Bru was first produced in 1901, in the town of Falkirk, under the name Strachan's brew. In 1946, a change in laws required that the word "brew" be removed from the name, as the drink is not technically brewed. The chairman of the company came up with the idea of changing both halves of the name to a phonetic spelling, giving the current Irn-Bru brand. Irn-Bru is widely reputed to be an excellent cure for hangovers. This claim has some foundation in truth—all caffeinated drinks will soothe headaches to an extent, and sugary drinks will replace lost fluids and sugars. It is often used as a mixer with alcoholic beverages—mainly vodka and whisky. Indeed, the alcopop WKD (produced by Beverage Brands) was originally launched as an alcoholic equivalent of Irn-Bru.